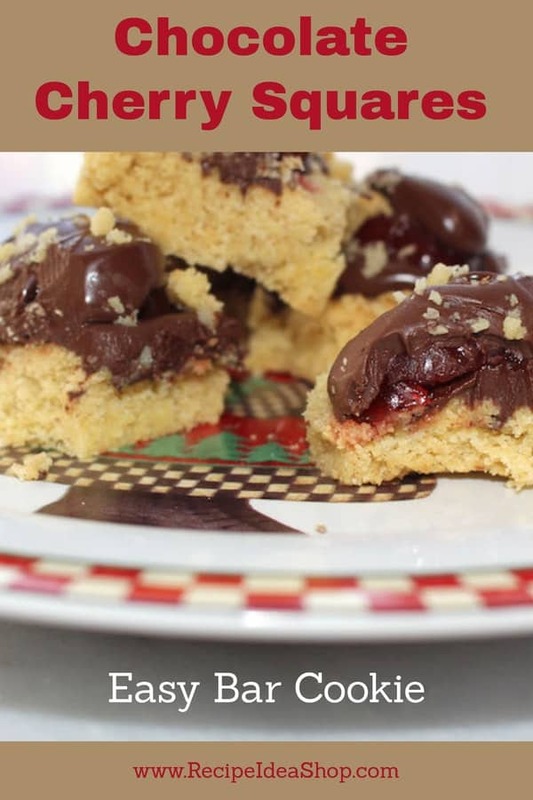 Chocolate Cherry Squares Cookies look like they took you a long time to make them, but they are SO easy. 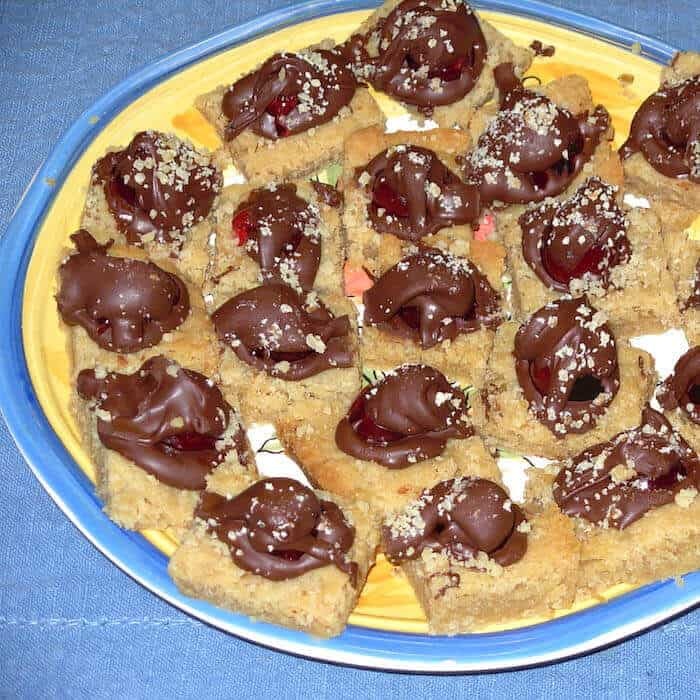 A simple shortbread bar cookie, topped with chocolate and cherries. Yum! 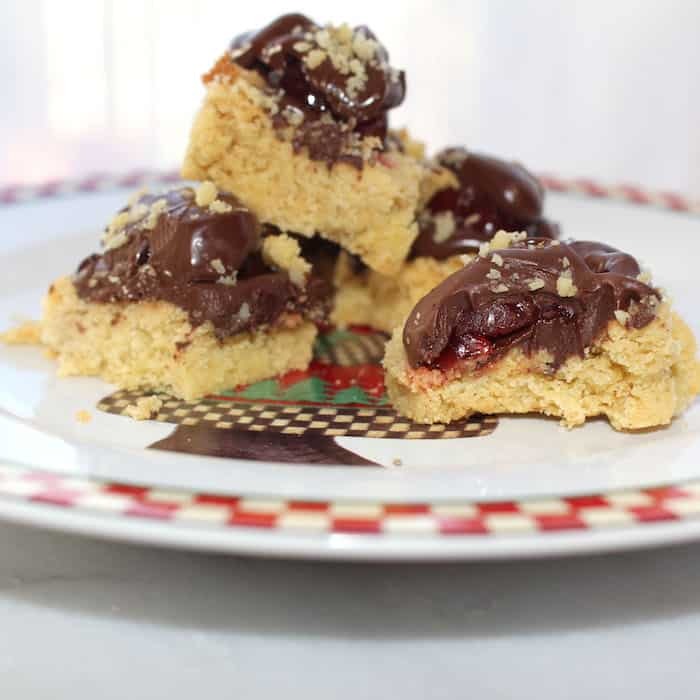 Chocolate Cherry Squares Cookies are so pretty on the plate and people love them. Hi. It’s Lois in the kitchen at Recipe Idea Shop, telling you about Chocolate Cherry Squares, a beautiful bar cookie I have been making annually since the 1980s. 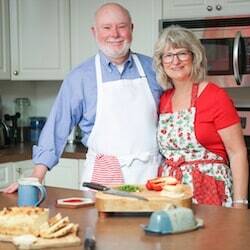 With the holidays just around the corner, I am again posting some of my favorite holiday recipes. I love these cookies and so does my daughter Erin. “Funny story” about these cookies. One year I mailed Erin a box of these cookies along with several other chocolate cookies and candies. Her roommate put the box under the tree without opening the outer box, never thinking it might contain food. Their two dogs got into the package in the middle of the night, eating most of the goodies. (Did you know dogs can die from eating chocolate?) It took two emergency trips to the vet and cost her about $1,000 to save their lives, and she didn’t get one cookie from the batch! 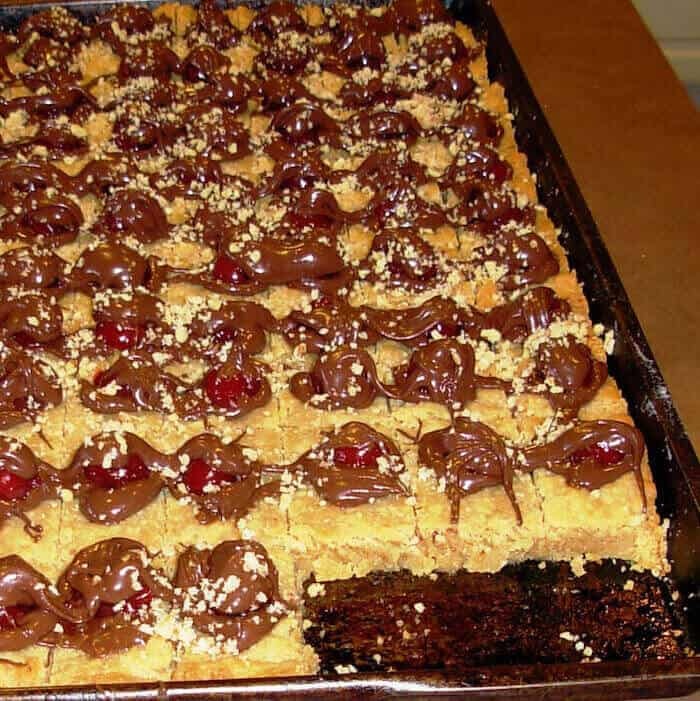 A pan of Chocolate Cherry Squares before plating. Even though Erin no longer has any pets, since then, I send any edible goodies to Erin’s office. 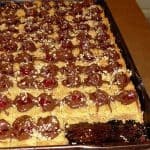 Chocolate Cherry Squares, ready for guests. These are easy bar cookies that look very hard to make. At the holidays, they are beautiful served with other Christmas cookies. Combine first three cookie ingredients. Press into an 8" x 8" pan. Bake at 350F degrees for 20 minutes. The cookies will be just slightly brown when they are done. Cut into 2" squares while still warm (very important). Top each cookie square with a dab of melted chocolate. Put 1/2 a cherry on top of each dab of chocolate. With a teaspoon, dab more chocolate over the cherry. Set aside until chocolate is firm. If you double the recipe, use a 9" x 13" pan. 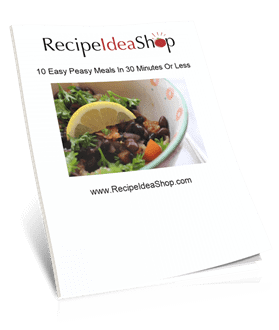 For a cookie sheet, multiply the recipe by four. 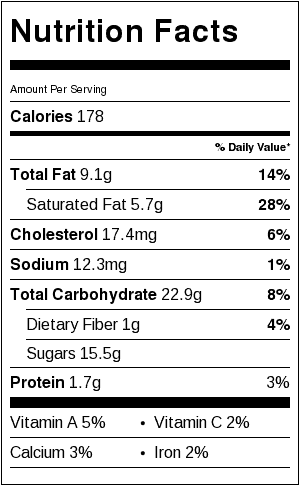 Chocolate Cherry Squares Nutrition Label. Each serving is one cookie.